For all 2016 Prospect Ranking Scouting Reports – click here (these will come out one a day over the offseason). Blake Trahan was selected by the Cincinnati Reds in the 3rd round of the 2015 draft. The team sent him to Billings where he would he be entrenched as the shortstop for the Mustangs. The season got out to a great start as he went 2-3 with two walks and two steals in his first game. For the first week of the season he would hit .263 with a triple. In the second and final week of June he would get a hit in each of his six games played, going 8-25 (.320) on the week with a double, triple and two walks. 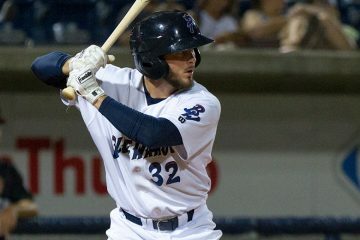 In 11 games over the course of June, Trahan hit .295/.380/.409 with four walks, five strikeouts, a double and two triples. June ended with a six game hitting streak and July continued with the hot hitting. The shortstop extended it to 11 games by getting a hit in all five games over the first week, hitting .292 with a double and two walks. The hitting streak moved to 16 games with another week of hits in all five games played for Trahan, who went 9-18 with a double, triple and five walks on the week with just one strikeout. The hitting streak would reach 18 games before coming to an end on the 18th. In the third week of July he would hit .269 with two walks. After a slow week, the final eight games were big for the infielder as he went 12-33 (.364) with two doubles and a home run. 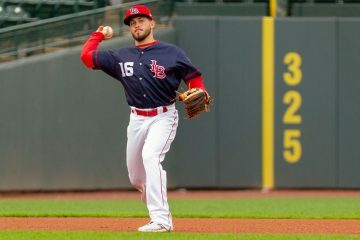 Trahan finished July with a .347/.402/.436 line to go along with six extra-base hits, 10 walks and nine strikeouts. August got out to a slow start. Trahan went 0-4 with a walk on the 1st of the month, then didn’t play for five days until the 6th, going 0-4. From the 7th through the 9th he would go 1-8 with two walks. Starting on the 10th things would pick up again and over the next seven games he would go 9-25 (.360) with eight walks and a strikeout to go along with three doubles and four steals. After the 18th he would be promoted to Daytona to fill in at shortstop for Calten Daal who was it in the face by a pitch. The jump up in competition was a tougher transition for the shortstop who went 2-21 in the first week at the new level, though he only struck out once in that time. The second week was just as tough though as he would go 2-14 with four strikeouts to finish out the season. With the Tortugas making a run to the Florida State League Championship Series, Blake Trahan was able to turn things around, going 6-20 (.300) in the six games. Hitting | Trahan shows a fringe-average hit tool. He can and does use the entire field and his above-average speed could help him leg out a few additional infield hits that let his average play up over the raw hit tool. Power | There’s not much power in his game today and he’s not likely to grow into much. He’s probably not a guy who will threaten double digit home runs or pile up a lot of doubles. Running | Trahan show above-average speed on a consistent basis and he uses it well on the base paths. Throwing | His arm strength rates out as slightly above-average and plays just fine at shortstop. Defense | At shortstop his range is limited, leaving some questions about whether he can play there every day or if he should move to second base in the future. He’s got soft hands and good motions in the field. The bat is a bit concerning already for Trahan as his lack of power was glaring in the Pioneer League. Looking at his spray chart below, he hit just .270 when he went to right field and that came along with a .324 slugging percentage. He also went to right field significantly more than he pulled the ball. His speed will help him out on the offensive side, but more advanced pitching may be able to take advantage of his weaknesses more easily as he reached higher levels if he can’t adjust his current approach. He seems to have a solid understanding of the strikezone and he’s able to keep his bat in the zone for a long time, allowing him to make plenty of contact and battle pitchers pitches well. Defensively he profiles more as a second baseman than as a pure shortstop. While he can likely cover you as a backup shortstop he doesn’t quite have the range to play every day with the bat that he profiles to have. He seems like more of a potential utility player, but there may be just enough bat there to play at second base if he can get the most from his offensive tools.